Cast, Architectural, Etched, or those requiring ADA specifications, We work with you and Gemini to create the marker, seal or plaque you need. Whether you require lead and mercury free bronze, high-grade aluminum, lead-free brass or #304 or even #316 stainless steel, Gemini has the metal you need to make a lasting impression. 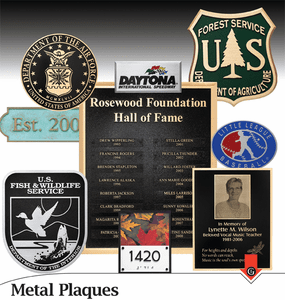 Recognize someone for a job well done, a retirement, winning an award, memorialize a loved one or commemorate a historic place – our specialized plaque sales staff is ready to assist you.